The Komun Academy aims at discussing and finding solutions to both local, specific problems as well as universal contradictions (human freedom issues, women’s oppression, ecological crises, capitalist exploitation, racial supremacy, colonialism, knowledge imperialism, poverty, war, etc.) through the perspective proposed by Abdullah Öcalan’s democratic, ecological, and women’s liberationist paradigm with Democratic Confederalism as its political system. We want to make our contribution to dismantling Capitalist Modernity and its ideological pillars through our contribution to Democratic Modernity via a freedom-based notion of knowing, learning, and educating. Every summer since 2015, the Turkish state has systematically been setting forest fires in the occupied and oppressed northern part of Kurdistan. This phenomenon has been state policy since the formation of the Turkish republic in 1923 with the aim to suppress revolt and forcibly displace populations. This year, the forests of Kurdistan have been burning again from summer until late autumn. Early September it seemed as though the fires were finally over. But in its destructive fury, the Turkish army attacked the forests again as soon as the rain clouds passed by. Never before had the oak forests been burning so excessively in autumn! While the forest fires in the neighbouring state of Greece in the summer of 2018, which caused the death of many people, rightfully evoked the attention of the world, practically nobody is interested in the destruction of northern Kurdistan’s forests. The fight for the Hambach Forest in Germany’s North Rhine-Westphalia, which we fully support1, is another important, current topic of concern. However, no international media, apart from few leftist outlets, report about the ecological catastrophe that the state-caused forest fires in Kurdistan lead to. Likewise, the big environmental organizations that otherwise operate internationally and formulate high standards for their work, completely bypass this topic. Are the forests of Greece and California worth more than those in Kurdistan? Is Kurdistan’s nature ecologically less meaningful than that of Sweden or South Africa? There is no doubt about the fact that practically all forest fires in northern Kurdistan are set by the Turkish army. Just like in the 1990s, it is especially the incendiary droppings from the helicopters or the artillery, that enflame the fires. There are dozens of eye witness accounts of affected people from the nearby villages, who can report about the ways in which the forest fires are intentionally laid by the army. In other words, unlike what is often claimed, the fires are rarely caused by the clashes against the guerrillas of the Kurdistan Workers’ Party (PKK), who act in the mountains and in the forests. Likewise, it is extremely rare for the forests in Kurdistan to catch fire due to things like heat, bonfires or cigarettes. Whenever forests do burn, it is usually very limited locally and temporally. This is because the oak trees, named “mazi” or “mêşe”, are too resistant in this climate. In the context of the Turkish army’s forest arson, this is just a blessing in disguise. If the affected areas were coniferous forests, as is the case on the Mediterranean or Aegean coasts, the few remaining forests would have completely disappeared by now. One hundred years ago, Kurdistan hosted three times the size of the forests that were used in the 20th century mostly for heating purposes. Once the forest is lost, it will not grow back in a naturally biological process. Since the oak forests of Kurdistan burn slowly, it often happens that the fires cease within a few days. Therefore, for several days, the Turkish army continues to drop more incendiary packages on the forests. The forest fires in 2018 exceeded the fires in the previous years in terms of their intensity. While between 2015 and 2017 an estimated 10.000 hectares of forest were destroyed or at least severely harmed in northern Kurdistan annually, the destroyed forest areas are likely to have increased to 15.000 hectares. There are no reliable numbers for 2015 at the moment. About a quarter to a third of the burnt forest areas are in Dersim. Dersim is the Kurdish province with the largest forests and home to remarkably many remote mountain regions. Other provinces with important forests are Çewlig (Bingöl), Amed (Diyarbakır), Bidlîs (Bitlis), Şirnex (Şırnak), Mêrdîn (Mardin) and Çolemêrg (Hakkari). 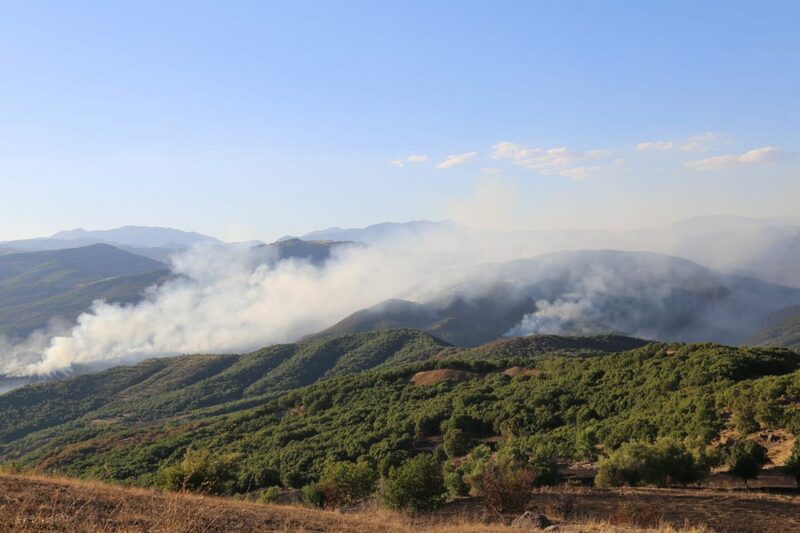 Until July 2018, the number and scope of the forest fires in northern Kurdistan were limited, but this dramatically changed at the beginning of August. Within days, forests were burning from Çolemêrg to Dersim. In the centre of Dersim, the fire of a largely unpopulated area (the villages in the area had been destroyed in the 1990s by the army) in the small town of Hozat came into sight. Concerned people wanted to rush to the scene to extinguish the fire in the endangered forest. Since 2015, engaged people in Dersim had been calling for organized extinguishing. This year again, as is often the case, the groups were not able to pass by the military checks and were sent back. This was met with major criticism, after which the bar association of Dersim issued a statement, calling on the state authorities to put down the forest fire. Fortunately, relatively many media outlets, including liberal ones, picked up on this incident. Due to the public pressure, the governor of Dersim had to make a public statement, which is a rarity for state crimes. The forest fires are normally denied in a colonial manner. Soon, members of parliament from the Peoples’ Democratic Party (HDP) and well-known artists came to Dersim and formed new volunteer groups, who could fortunately make their way to the regions through alternative routes. By means of bundles of branches and twigs, a traditional method among the Kurdish community, the forest fires were contained and eventually extinguished. The group was able to announce its victory live. Since the beginning of the war in the summer of 2015, this was a rare moment of victory due to the resistance of the people of Dersim. 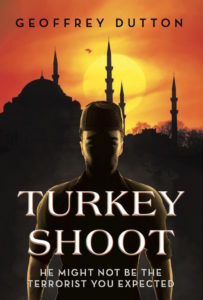 But only two days later – it was the end of August by then – the same forest was re-ignited by the Turkish army. Once again, the angry communities of Dersim saw the true, destructive, extremely authoritarian and colonialist face of the Turkish state. This time the state had established further security checks on the road to obstruct the arrival of renewed initiatives by volunteers. In the meantime, the state-incited forest fires in other provinces of northern Kurdistan increased; in more than ten other places such as in northern Amed, Bidlîs, Şirnex and Mêrdîn forests started burning again. Luckily, it rained in Dersim in the first week of September so that the fires could be extinguished. But when the rain didn’t happen in September, the Turkish army took action once again. The forests burned again, this time especially in the district of Pilemorî (Pülümür). The ecologically concerned people once again reacted quickly and called on everyone to help extinguishing the fires. They had to travel to Pilemorî several times to extinguish the fires. Almost every year, affected people from the nearby villages report about how the forest fires reach their villages and destroy their means and conditions of life. Many of them live from the livelihood which they generate from the forest, without destroying it; but the forest fires erase the fundamental basis of their existence. The fires also destroy the pasture areas for their animals. It can even happen that people are forced to sell animals below their value, because they have to buy expensive, unaffordable food for the animals. Their fruit and vegetable gardens also get destroyed in the fires; even their fields burn. The incidents described above take place every summer in northern Kurdistan. The violence is not limited to the state repression in the cities and villages, the destruction of entire cities and districts, the thousands of imprisonments and sackings of civil servants – the people are also forced to watch the destruction of the lungs of their nature. The Turkish state’s war against the population is comprehensive. More than ever, the state attacks all of the living conditions that it considers as a threat, whether in the cities or in the villages. The destruction of human existence through forest fires is clearly willed by the Turkish war machine. It is a system. One aspect of this strategy is the displacement of people from their natural habitat. The social cohesion and solidary life are rooted more strongly in the villages than in the cities, where the population is less politically organized and more vulnerable to cultural assimilation. The reproduction of Kurdish language and culture, which are not part of the capitalist nation-state, are thus supposed to be restricted. Forest fires in proximity of villages are set partly to displace the civilian population from the rural areas. This way, the Turkish army’s war of destruction can be led more effectively – in other words, more brutally. This would separate the guerrilla from the population and could be fought by the military with bigger weapons, including chemical weapons. Furthermore, the destruction of the forests is an attempt to destroy the guerrillas’ spheres of life and action. Forests immediately neighbouring military stations or those in remote valleys where guerrillas could be dwelling, are targeted by the army in particular. Let us thus return to the questions we posed at the beginning, about why nobody on earth seems to care about the nature that is being systematically and consciously destroyed by the Turkish state. Of course, ecologically speaking, the forests of Kurdistan are not worth less than others. After all, they constitute some of the only remaining forests in the Middle East. De facto, there is no forest left in the region apart from the sea shores of Turkey, the Iranian region at the Caspian Sea and the coastal strip of the Levante, from Latakia to Lebanon. It is important to consider that the forests outside of Kurdistan, which reach all the way to Luristan in eastern Kurdistan/Iran, are under enormous settlement pressure. Thus, it is only logical to stand against the destruction of Kurdistan’s forests. On the long-term scale, Kurdistan’s forests are very important and could be a starting point to revive the vegetation in Kurdistan and the surrounding lands. In any case, it would be wrong to measure forests against each other in terms of their worth. This would lead to meaningless competition. All forests are valuable and must be protected. Let’s think further: Without a doubt, the reports of the Kurds, the Kurdish media and the circles close to them are not adjusted to the usual international terminologies and norms of communication. At times, they might be difficult to understand. Yet, this must not become an excuse not to care. Interested and sensitive circles should not be bothered by such things. Otherwise, such approach would be rather arrogant and Euro-centric. There are plenty of campaigns around the world, often for tropical forests, which rightfully emerged without explicit calls for international attention having to be made. As stated above, for years, despite severe state repression, active resistance has been led in northern Kurdistan against the state-caused forest fires. Could the silence be due to the prejudices of the bourgeois public and the big, often liberal environmental organizations against the Kurds and the Kurdish freedom movement? Is it not ignorance and lack of awareness about Kurdistan and the Middle East, which are seen as “dangerous, extreme and obscure”, that reinforce this attitude? Another factor is probably the caution against affinity with the Kurds, who are honourably fighting for their freedom. This means that these silent circles often wish to avoid conflict with the Turkish government and nationalist-religiously extremist circles by trying to overlook the situation in Kurdistan. If vast forest areas were systematically burnt down and destroyed by the central government in any other country to defeat rebellious communities, it is very likely that there would be a lot more criticism on an international level. We know of no other country where this is happening to such an extent at the moment. This article was an attempt to think about the lack of international engagement with the forest fires in northern Kurdistan. Criticism is welcome.